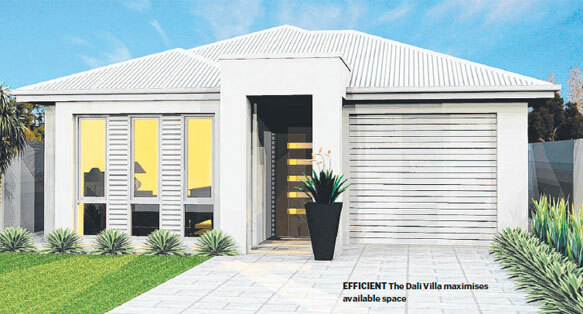 Designed specifically for young families and couples, the Dali Villa offers innovative design that doesn't compromise on living space. With three bedrooms, two bathrooms and an open-plan living area, the design offers enough space for a young family or couple to live comfortably and still have enough room for storage, a feature not typical of a villa allotment. "Normally with villa-style homes, there isn’t a lot of storage space and that’s something we have really included into this design," Gallery Living marketing manager Lee Goddard says. "It is something our customers have been asking for. People always want more storage space." Next to the kitchen is a flexible, multipurpose storage room adjacent to a large walk-in pantry. Each bedroom also has room for built-in wardrobes. The entrance hall runs the length of the home opening into the open-plan meals, kitchen and living area at the back. "With most villa blocks the entertaining is mainly at the back of the house, this design encourages the living area to flow straight through to the entertaining area at the back. If you open the door at the front of the home, you can see straight through to the back open-plan living space," Lee says. "The three-way bathroom is a really practical feature of the home, especially if you entertain a lot. If you have children over, the bathroom area can be shut off to keep it clean but still have the toilet and vanity open for your guests to use." The home is designed to maximise energy efficiency, using light-weight construction materials that help to reduce power costs by keeping the home cooler in summer. Large windows help to fully utilise the sun for lighting and heating. The single carport opens internally to the main hall to provide secure entry to the home. Lee says it is also very convenient when unloading groceries from the car. An open study area has been included opposite the internal entrance that provides a sanctuary for a home office, or kids retreat for family owners. Alternatively, Lee suggests this area could be removed to make the bedrooms larger. While the design caters to a narrow block size of 9m wide, Lee says the design would be ideal as a sub-division plan on a wider block.